During the nearly 90 years it has produced some 30 different pulkmodeller from Segebaden. Our seamstress has an eye on them all and sew a new canopy for your particular sledding when it has worn out. On our website there is a table with the most common pulkmodellerna. There you can see the sled you have before you order your new canopy. Then send your sledge to us, or buy a do-it-yourself kits. 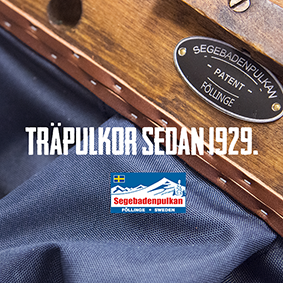 Throughout it’s history, Segebaden has produced around 30 different models of sleds, and our excellent craftsmanship also shows itself in the canopies that we make. Whether we are making a new canopy from scratch or repairing an old one, you can feel secure in the knowledge that you will be receiving a great, quality product made in the time old ways. Before you order your new canopy, you are able to match your sled with a list of our most popular sled models and be sure that you are getting the right canopy for your sled. Once you have made your match, you can send your sled in to us and we can do the work for you or you can make your sled even more personal and buy one of our do-it-yourself kits . Det här kapellet har en stor öppning i mitten som gör det lätt att lasta i och ur. Kapellet stängs igen med ett snöre som du fäster i öglor och krokar. Med hjälp av ett extra snöre kan du dessutom fästa mindre ömtålig packning, till exempel renskinn, yxa och spade, ovanpå kapellet. Standardkapellet kan utrustas med ett avtagbart vindskydd, men är inte formsytt för det på samma sätt som vårt barnkapell. Our standard canopy has a large opening in the middle, which makes it very easy to load and unload. The canopy is fastened with eyelets and cordage which is easier to handle in cold weather, plus you can also strap down other items on the outside of the sled such as reindeer skins, axes and spades for easy access. A removable windshield can also be fitted to the canopy, but please not that it is not form fitting like the children’s canopy. This canopy has been designed so that a windshield can be attached, which means that your precious cargo will be protected from oncoming wind. The canopy has two openings, one in front and one behind the windshield. 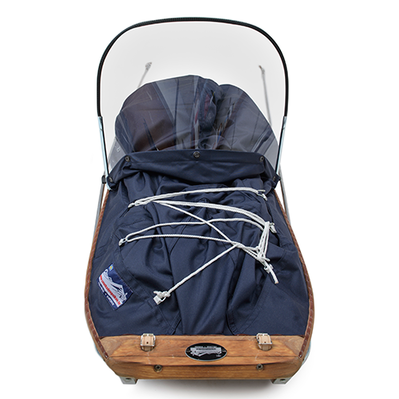 This means that if the weather turns bad you can quickly pull on the cordage of the rear section and the canopy will snugly wrap around your child, which adds extra protection against the elements. The front section has zips and a snow lock so you are easily able to access your essentials in the sled or even take off your sleeping child’s shoes without waking them up. 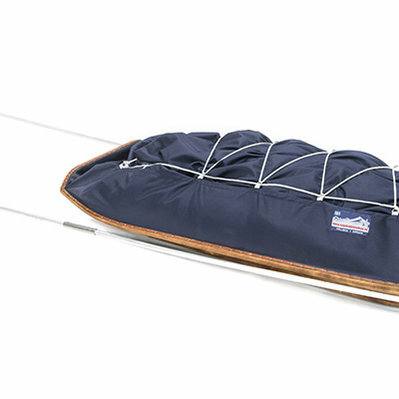 Our canopies are securely mounted with leather straps that are nailed along the sled’s sides in the time honored way.